This summer, lots of campers will learn the ins and outs of canoeing and campfires, but one local camp is teaching kids from 8 to 18 how to braise, sear and sauté. See photos. DULLES, Va. — In a loud and hurried voice, Francesca Binder yells, “Hot behind!” as she runs a steaming saucepan past a line of cooks standing between the stove’s burner and the prep table. She picks up a whisk and adds pads of butter in between her quick strokes until the melted white chocolate reaches the silky smooth consistency she’s after. A perfectly ripe strawberry gets dunked into the rich mixture, and then it’s placed on parchment paper to set. Her masterpiece is ready, but Binder is not pleased. “It doesn’t taste bad, it just smells kind of funny from the butter,” she says. Her sous chef, Josh Taylor, disagrees. He says the white chocolate is the best thing he’s eaten all week. “The flavor is a tiny bit different,” he says after taking a sample. He goes back for more. It sounds like a scene straight out of a downtown D.C. restaurant, but Binder and Taylor are only 10 years old, and they’re in a kitchen on the first floor of Dulles Town Center at Camp Cookology. This summer, lots of campers will learn the ins and outs of canoeing and campfires, but Cookology is teaching kids from 8 to 18 how to braise, sear and sauté. 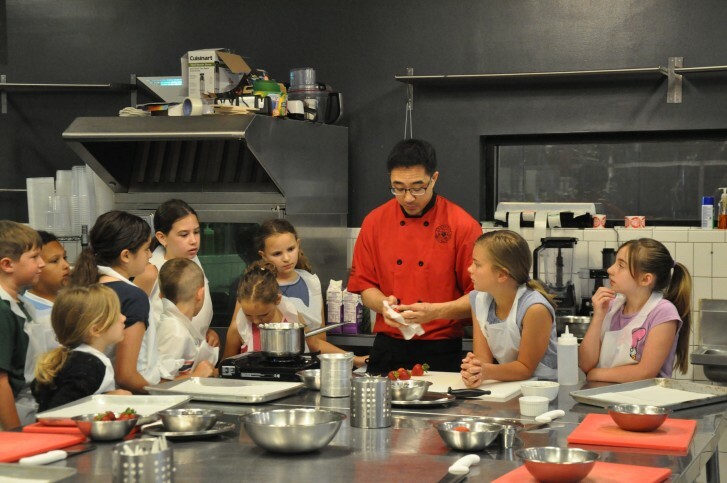 For nine weeks of the summer, Cookology teaches around 500 kids knife skills, pastry techniques and advanced cooking methods in camps dedicated to baking, international cuisine and homestyle cooking. Cookology even offers a gluten-free week for those with allergies. Dawson says introducing kids to the kitchen gives them a sense of empowerment. They get to handle things that are often off limits, like flames, knives and expensive cuts of meat. The hands-on experience also gets the young chefs to think more about their food — where it comes from and how it’s prepared — and it encourages them to try unfamiliar flavors. “Instead of just saying, ‘Oh, this is the plate that mom gave me,’ … they get to see shallots and garlic and mushrooms. They get to see how you double boil chocolate. They’re working with real ingredients,” Dawson said. Samuel Maphis, a camper in Cookology’s Culinary Boot Camp for 8-to 11-year-olds, says at Cookology, he discovered he’s a fan of soup. “I didn’t really think I’d like some of the soups, but then I tried it and I couldn’t stop eating it — all of them,” he said. The homemade ramen was especially a hit. It made him realize the Japanese staple is so much more than a discounted package of dried noodles. “I didn’t even know that you had to add that much stuff,” Maphis said. Dawson says similar to more traditional camps, cooking camp teaches communication, camaraderie and team building. It also sends kids home with a set of skills that will last a lifetime. “People want to be in the kitchen and get their hands dirty, make friends, and this is just a really fun environment for them to do that,” Dawson said. At the front of the room, Chef Tony, who leads Cookology’s Culinary Boot Camp, clears his throat. Binder and Taylor push their strawberries to the side and give him their full attention. It’s on to the fish course. This summer, Cookology is partnering up with Sehkraft in Arlington, Virginia, to offer kids cooking camps in Clarendon Aug. 1-26, in addition to its camps at Dulles Town Center. More information is available on Cookology’s website.